Killer robots. They’re a bit of a cliché, aren’t they? 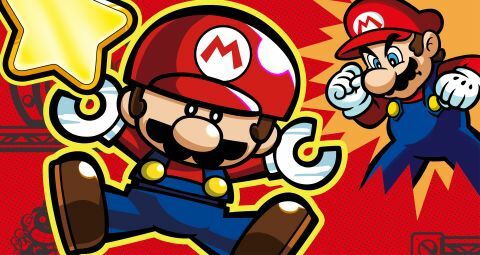 Well, trust Nintendo to put a new spin on things – in Tipping Stars, Mario’s clockwork ‘bots (known as ‘minis’) are less intent on destroying the world and more on destroying themselves. They’ll walk blindly off sheer drops, plonk themselves into spikes or even walk straight into the fiery attacks of a Piranha Plant. In short, they’re useless, and that’s where you come in. Of course, this is familiar stuff for anyone who’s played any of the Mario vs Donkey Kong sequels. As ever you’re tasked with re-jigging the environment to coerce your troop of mechanical dunces to safety, gobbling up as many collectables as possible along the way. It plays a bit like a level editor (stay with me, it’s more fun than it sounds) except with the added pressure of having to babysit some idiot robots. To begin with this boils down to little more than creating and removing bridges, complicated slightly by the fact that you only have a finite amount of building pieces to go around. This forces you to scrap bridges you’re done with to make sure you don’t run out later on. It’s simple stuff, but materialising a bridge just below clockwork Princess Peach before she plummets to a spiky demise, is properly satisfying. Equally, when you mess things up at the last minute, it’s infuriating, though that’s never the game’s fault, and the small-scale levels ensure it doesn’t take long to rectify your mistake. I wouldn’t mind the option of getting the minis to move a little faster though. Occasionally I’d set up a route for them and have to twiddle my thumbs while they made their way to the exit. Still, this is a minor complaint and one that’s soon made redundant as later levels throw plenty at you to keep you on your toes. This little box is basically just a shout-out to the game’s lovely music. It takes classic Mushroom Kingdom earworms (particular kudos to World 4-1’s subtle use of the Super Mario Bros underground theme) as well as original tunes, and remixes them so that they sound as though they’re being parped out by a 1950s fairground ride. It’s like all the fun of being at an amusement park without squawking toddlers hyped up on candyfloss or post-rollercoaster adolescents barfing all over the place. Central to that is a whole bunch of new takes on Mushroom Kingdom enemies. It’s interesting to revisit foes you’ve beaten a gazillion times over in other games in a brand new context. You may know how to time your run under a Thwomp perfectly in a Super Mario game, but that’s not so simple when character movement is out of your control. Making puzzles out of usually insignificantly simple enemies is a clever move, and one that leaves you feeling underpowered despite your omniscient viewpoint. One of the best new baddies comes at the end of each World in the form of freakish demon-monkey-robot-things (yes, that’s their official title, honest) which possess one of your minis, sending it on a destructive spree. It adds a sense of urgency to an otherwise fairly sedate game, an excellent replacement for the duff boss fights the series has previously offered. I’m looking at you, Mini Land Mayhem. Often, the enemies are the least of your concerns, with the task of getting a mustachioed ‘bot from A to B being the biggest challenge. Each World opens with the introduction of a new concept (including reversible conveyor belts, vertical elevators, and classic Mario pipes) and combines these with previous additions to build increasingly complex environments. If that sounds daunting, don’t worry; the learning curve is incredibly smooth. Finding a way through the level rarely takes more than a few attempts, but doing so while collecting every last collectible – necessary to snag those elusive gold trophies – will tax even the sharpest minds. It’s worthwhile taking the time to collect those trophies too. Gather enough and you’ll begin to unlock bonus levels, some of which made me mutter some seriously rude words. They’re head-scratchingly clever as well as maddeningly tricky. Trophies also reward you with stars, and these offer unlockables in the game’s in-built level editor. There’s a pretty solid selection of parts to start with, but stars provide you with more complex mechanics to play with, such as character-specific goal doors, or those pesky demon-monkey-robot-things. The interface is solid, if a little cumbersome to navigate at times, though certainly not enough to stop the most dedicated fans building crazy labyrinthine death traps for their minis to explore. Even better, with the new community features, these can be shared between users, who can rate the best ones. At the time of writing, I wasn’t able to try this out, but I have a lot of faith in the Nintendo community to build some cool levels (and probably some shaped like genitalia) to keep me playing long after I’ve exhausted the in-built content. Although it remains a simple - and for the most part unchanged - concept, the Mario vs. Donkey Kong formula has been honed to near-perfection over the years. Tipping Stars is far from revolutionary, but for quick bursts of action-puzzling, there’s little better. While the cast of robotic minis might be brainless, the game they star in is anything but. Description Help your minis reach their designated goals while solving puzzles in this HD remake.